Our optometrist in Chattanooga, TN takes the time to explain the results of your eye exam, describe your options and listen to your eye care needs. Because maintaining good eye health is an ongoing partnership, we encourage you to ask questions and share your health information, which could be vital to monitoring, diagnosing and treating potential vision problems. Dr. Spencer Sechler is a native of Warren, Ohio. He attended the University of Akron and received a Bachelor’s degree in Biology with a minor in Chemistry from the Honors College in 2012. He received his doctorate from the University of Alabama at Birmingham School of Optometry with honors in 2016. Dr. Sechler was a member of Beta Sigma Kappa Honor Society, the American Optometric Student Association, Fellowship of Christian Optometrists, Sports Vision Club, and represented his optometry school at the annual National Student Optometry Bowl in Seattle, Washington in 2015. Dr. Sechler completed a residency in ocular disease and pathology at Southeast Eye Specialists in Chattanooga, TN in 2017. During his residency, he received extensive experience in referral based management of ocular disease, cataract pre/post-operative care, and glaucoma. His areas of interest include primary eye care, diagnosis and management of glaucoma, and specialty contact lenses. 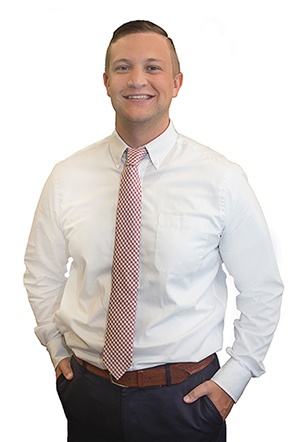 Dr. Sechler is a member of the American Optometric Association, Tennessee Association of Optometric Physicians, and the Southeastern Tennessee Optometric Physician Association. Dr. Sechler and his wife Laura, also an optometrist, currently live in Chattanooga. They enjoy crafting, woodworking, and repurposing furniture. In his free time, Dr. Sechler enjoys exercising, golfing, and watching basketball and football. He is excited to call Chattanooga his home and provide eyecare to the community.